Terry was educated at Queensway First School and then Queensway Junior School before attending Charles Burrell High School and the adjacent Sixth Form College to complete his A-levels. 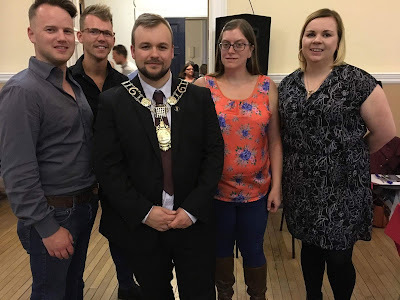 He originally intended to become a Geography teacher and despite studying Geography, Business Studies and Politics successfully at A Level; he opted to continue a role working locally for the Keystone Development Trust as a Community Development Worker. Terry developed his passion for youth work and supporting the young people of Thetford and stayed with Keystone for 7 years. During this time Terry managed the Abbey Community Centre on the Abbey Estate and supported local groups with fundraising and grant applications. Following this he went on to work for the Benjamin Foundation, overseeing the creation of the Meet Up Cafe on the Redcastle Estate – a support service for children and young people that continues to run today. Following his election to Breckland Council, and subsequent election as the Leader of the Opposition, Terry decided to give up his full-time work and instead works on a self-employed basis supporting local charities. In September 2014 Terry, along with his brother, purchased the publishing rights to the About Thetford magazine and has served as its Editor ever since. At Thetford Town Council, Terry has taken an active role in a number of committees and has previously served as the Chairman of several including; Amenities, the Charles Burrell Centre steering committee and the Personnel Committee. During the 2015/16 Mayoral year he served as the Chairman of the Finance Committee. Terry likes to keep active and attends the Park Run activity in Thetford most Saturdays and swims at Thetford Leisure Centre several evenings each week. He has undertaken fundraising runs and completed a half-marathon in 2015 and is hoping to complete an organised run during his Mayoral year. Terry will be supported in his year as Mayor by his Consort, Corinne Fulford. Corinne is a former Town Councillor herself serving from 2011 to 2015. She is well known locally for her community work including past work with the Dad’s Army Museum, STAG and various local groups. Corinne is a Director of the Leaping Hare Community Interest Company, which provides Thetford’s Great Information Centre. Corinne will be a valuable asset helping to promote the many great things about Thetford at the various places the Mayor gets invited to. Terry’s theme for the year will be about inspiring young people and will be raising funds throughout his year to support projects that support and inspire young people locally. The Mayor’s Chaplain is Canon Bob Baker who is a member of Thetford Team Ministry. Terry and Corinne are keen to support all manner of local organisations and events. Arrangements should be made through the Civic Secretary civicsecretary@thetfordtowncouncil.gov.uk or on tel: 01842 754247.